AHCA Silver National Quality Award Winner 2017! 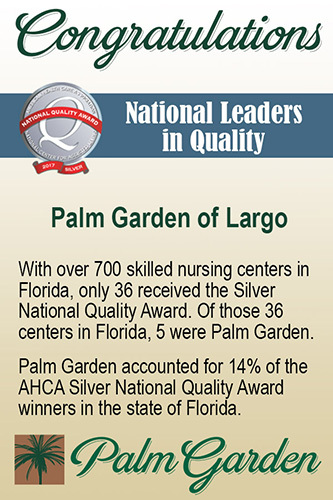 Palm Garden of Largo has been recognized as a 2017 Silver – Achievement in Quality Award recipient by the American Health Care Association and National Center for Assisted Living (AHCA/NCAL). The award is the second of three distinctions possible through the AHCA/NCAL National Quality Award Program, which was established in 1996 and spotlights providers across the nation that have demonstrated their commitment to improving quality of care for residents and patients in long term and post-acute care centers and communities.